Catherine Nazarene, aka “Little Sparkie,” founded Little Sparkie Electric in 2007, and is the managing member and a working licensed Maryland and Virginia Master Electrician. Her husband John, is the working foreman and IT brains of the company, while Carla McRorie is the secretary and bookkeeper. Catherine Nazarene, who formerly worked as a CPA and tax specialist, decided to switch careers because of her life-long love of things electrical. Even as a child, she was fascinated with light bulbs, and would buy lamp holders (fixtures or sockets), plugs, and wire, and put them together from scratch. Substations were another particular interest of hers, and they still fascinate her today. “Sparkie” is an old name for an electrician or anyone in the electrical trade. The person who originally fired up her returning interest in electrical work went by that handle. One day the two of them cooked up the name “Little Sparkie” because she was so much smaller than her colleague. In fact, Catherine is small by anyone’s standards, so the name of it was a natural. “Giving it to the company I founded is one way I try to ‘pay it forward,’” says Catherine. Who REALLY runs Little Sparkie Electric? 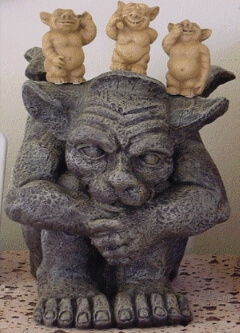 Meet Emmett the Gargoyle and his entourage of “Gargiggles”.